Onsen, Na'vi and black eggs. The journey to Hakone involves platform-lifts, chair-lifts, elevators, trains, metro, cable train and cable car (ropeway) as well as some energetic pushing and pulling up and down very steep hills. Mount Hakone is famous for it's hot springs, peaceful lake and eggs boiled in simmering hot pools. These eggs, their shells turned black by sulphur, are said to prolong life. The 'boiling valley' is 1044 metres above sea level, and contains a lake created by volcanic activity; this was our destination and getting there was the great adventure. The day started with a first - my first travel on the JR line from my local station using a recently installed platform-lift; my destination was Tokyo Station and once there the accessible route to the next platform involved a journey deep underground 'behind the scenes' in one hundred year old tunnels. About 90 minutes out into the countryside we began our climb on a single track line that zig-zagged up the mountainside, going alternately backwards and forwards up the tree lined slopes. Moving from one mode of transport to another required up to four men lifting, pushing or pulling my wheelchair. 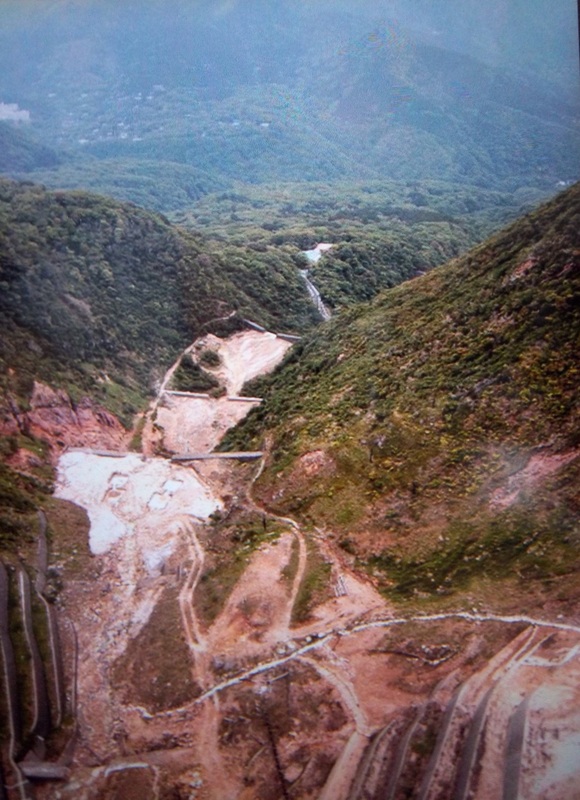 The cable-train gave way to cable-car and suddenly I was swinging up and over the trees, climbing from about 800 metres to 1044 where sulphurous 'smoke' seeped and billowed out of the earth in this steaming cauldron. I felt I was in an alternative scene from the film Avatar - one where the 'americans' had won the war with the native people - as I looked down on the scar of what looked like mining activity at the summit. Breaking our journey we paused to take in the smell, buy black eggs and wonder at the steaming earth. Swinging back over the treetops and expecting any moment to see strange flying beasts and giant blue Na'vi, we swooped down a couple hundred metres to the crater lake lying along the southwest wall of this complex volcano. Here we boarded mock pirate galleons and explored the 20 km length of lake Ashinoko and a view of the lakeside Shinto Temple. The lake is an incredibly quiet and peaceful place, we watched cranes patiently stalking fish, and overhead what might have been honey buzzards floating on thermals. I did feel incredibly free.